This artistic view shows gas around a forming galaxy in a large computer simulation. New clues about early star formation are putting a twinkle in astronomers’ eyes this week. Researchers have discovered clouds of primordial gas from 2 billion years after the Big Bang that confirm what had only been theorized: that early star formations consisted only of the three lightest elements on the periodic table. The study is published in the journal Science. A separate study published in Science suggests that early stars were much smaller than previously thought, contrary to earlier research that suggested the first stars were more massive than 100 suns. Takashi Hosokawa and colleagues found through numerical simulations that, in fact, the first stars were only about 43 times the mass of our sun. Long before any star was light or bright, according to the modern cosmological theory, during the first few minutes after the Big Bang, three primary elements existed in the universe: hydrogen, helium and lithium. The primordial gas is composed of the lightest elements in the periodic table and uncontaminated by the heavier periodic elements - termed “metals” - from stars. Over the course of hundreds of millions of years after the Big Bang, clumps of primordial gas condensed to form the first stars. For years, stargazing scientists have tried to find this “pristine” material but have failed - until now. “It’s quite exciting, because it’s the first evidence that fully matches the composition of the primordial gas predicted by the Big Bang theory,” lead author Michele Fumagalli said in a statement. Fumagalli, a graduate student at University of California, Santa Cruz, and colleagues found the two new pristine clouds while studying the gas properties of galaxies in the distant universe. Using the spectrometer on one of the world’s more powerful optical telescopes - the Keck I Telescope in Hawaii - astronomers analyzed the wavelengths and mapped out the gas distribution of these distant galaxies. “We can see absorption lines in the spectrum where the light was absorbed by the gas and that allows us to measure the composition of the gas,” Fumagalli said in a statement. The researchers are working to understand how common these primordial clouds are and how metals got released in the early galaxies, Fumagalli said. For more information, check out the Science podcast interview with Fumagalli. I do agree with all the ideas you've presented in your post. They are very convincing and will certainly work. Still, the posts are very short for beginners. Could you please extend them a bit from next time? Thanks for the post. Big bang , everything is spread out then eventually all matter is pulled back to center by gravity then compresses again until enough atoms are crushed that it bangs out again and this has been happening for eternity. Time is only concept of the mind. Where the hell did you pull this from? Seriously, I'm sorta curious where you picked up information like this because I'd like to identify where these claims keep coming from. I read misconceptions like these time and time again and I have no idea why people say it... it's not like creationist claims where you can generally google a single phrase and trace it back to one originator. The big bang doesn't describe matter being pulled back to a center by gravity. First of all, there is no center of the universe. The big bang theory in fact mandates that, it states that the universe itself expanded, meaning every point moves away from every other point. But it's not just that, it's that this is true in all directions. Consider, for a moment, if you had a sheet. Lets say you started stretching it, and you're at a random point near some edge. You'll find that you're moving away faster from points on the opposite edge of the center of the sheet as you do from your side of the sheet, speed is a function of direction, not distance. But in our universe, as it happens, we observe speed being a function of distance, so it's as though every point is either getting much smaller, or space itself getting much bigger. That is what the big bang says, and it does not allow for a center of the universe. And no, time is not 'only a concept of the mind', it is a dimension, as real as length, width, and height. You 'hear' time just as well as you 'see' space. Consider, for a moment, that every time you hear a sound, your ear preforms a Fourier transform to move from a time domain to a frequency domain. The ear-drum works like a spectrum-analyzer. You cannot have space without time, and you cannot have time without space. They are inherent dimensions in the universe, it just so happens that time is perpendicular to space. (Though there are more robust ways to frame that). I don't know how people got it in their heads that time is all in the mind, but we've known that cannot be true for the past 100+ years, where does this idea keep coming from? This is from what is known as the "Expansion and Retraction Theory". It stands alongside the Original Big Bang as a single event theory and the "Steady State Theory" in which rather than a seminal explosion, there is a constant stream of energy and matter coming through the focal point. All just theories. Now I got a side rant, can we stop using Theory and Hypothesis as meaning the same thing? They are not, What most people assume are Theories are actually Hypothesis. Therories stand up to repeated attempt to disprove them, with evidence. Hypotheisis are untested, and may or may not turn into a theory depending on testing and results. Once a Theory has passed all available or concieved tests, it then may become Law. Hypothesis: Gaian Hypothesis – John Lovelock – The idea that the earth is a living entity capible of Homeostatis, and that all life lives on the earth as a symbiotic relationship with it. Theory: The Theory of Plate Techtonics – The crust of the earth is broken up into large plates that shift and move across the surface of the planet. It has measured results backing it up, and direct evidence of it happening daily. If it doesn't have that or there is counterdicting evidence, a theory may be bumped back down to a Hypothesis. Law: Law of Inertia – Basically a object will remain in motion until an outside force interacts with it and changes it's motion. Observed, tested and can be taken for granted. Rarely does a Law get challenged, but if it did, it would become a Theory once more. Excellent article Andrew. You have helped my conceptualisation of the ‘big bang’ quite a bit – I think . Just remember that most mortals really struggle with these concepts. I would guess that most folks visualize the ‘big bang’ as an explosion taking place at a central point and rushing outwards. I did until I real this reply of yours. Up until now I have always visualized the universe as expanding outwards with ‘space’ being inside and ‘not nothing’ – non existence, being outside. From what I interpret, it would seem that this is also true for inside the ‘balloon’. Nope, gravity will not pull the matter back together as the universe has been proven to be expanding at an ever increasing rate despite the effect of gravity. What? Methinks you might have mangled your concepts. As it happens, the expansion of the universe has been accelerating, and the expansion of the universe allows us to see stars that are more than 13.7 billion lightyears away. The observable universe is ~50 billion lightyears long in any given direction, but the light from the edge of the visible universe is roughly 13.7 billion years old. It's exactly because the universe is expanding that this is possible. The distances when the light was emitted, however, was much, much smaller. And as the universe continues to expand, we are all doomed to a long slow heat death. Everything dies, including our universe. Very Tibetan Buddhist in a sense, it's almost like a self-existent Sand Mandala. But fortunately entropy will be reversed. Astronomy is a tricky business. Light from distant distant galaxies tends to be very faint, so faint in fact that you can have individual galaxies representing only a few pixels of light on an image. That means data collection is an inherently difficult business, and exposures tend to need to be very long for faint objects if you want to get some decent statistics on the data. This has nothing to do with aliens. And they're not 'just finding the light', they have 'just done the statistics on data they collected from galaxies very far away'. It's not 'finding the light' any more than you find light 2 million years old every night you look up and see the Andromeda galaxy (2 million lightyears away, rather close in a cosmological scale). So how do they do the statistics to confirm these results? Well, I haven't actually read the paper (too lazy to VPN to my school's connection now, will probably do so later), but they almost certainly just use form of spectroscopy where they look to try to find spectral lines from early elements. If you look at the wavelengths of the light coming from far away, there are going to be some discrete wavelengths missing corresponding to absorption or emission lines from various elements. It is like finding a fingerprint of elements inside your data. From these lines, you can determine the chemical composition of a galaxy, and determine relative element abundance. So they know how old the light is (based on how far away the galaxy is), and they know what comprises the galaxy (based on the spectroscopic data) so they then publish the results in the journal Science. Astronomers haven't discovered some special 'new light', it's just preforming analysis on data that happens to be old light. Some astronomers work on galactic astronomy, where they are looking at light from stars in our own galaxy that is much more recent, and see things like heavy elements. It just depends where you point the telescope, and what the researchers are looking for. As to the rest of your questions... yes, we evolved from apes (and are technically apes ourselves. Just like we are also mammals, or animals, 'ape' includes humans, along with chimps or gorillas. It's a larger classification.) And the big bang theory was made by Friedmann and Lemaître when they wanted to solve the Einstein equations without necessarily using a cosmological constant to create a 'stead state' universe. When Hubble showed that the universe was expanding, the expanding universe model (condescendingly coined "big bang" by Hoyle, a proponent of a static universe model) gained some traction, but it wasn't until Penzias and Wilson accidentally discovered the Cosmic Microwave Background (CMB) that the final nail in the coffin was really laid for steady state theory, and 'big bang' theory gained decent recognition as the best explanation for the expansion of the universe. Since then, with experiments like the COBE and WMAP satillites, we have a pretty solid foundation for big bang cosmology. If Jesus Christ was born 2,000 years ago then the bible claims that Jesus will return to Earth 2,000 years after his death then He must be in Heaven 2,000 light-years from here. It makes sense. Jesus` last words on the cross, `My God, my God, why hast thou forsaken me?` hardly seem like the words of a man who planned it that way. It doesn`t take Sherlock Holmes to figure there is something wrong here. Actually, the Bible claims that Jesus was supposed to return before 100 CE (about 521 BH): see Matthew 24 for specifics. However, the supposition that Jesus was limited to the speed of light is ... questionable, at best. When you attempt to mix religion and science–especially when you attempt to dictate one by the terms of the other–the results are usually nonsensical. We all came from the light, we all return to the light, its that simple! if I'm going at the speed of light and I cast a shadow, that could pull ahead thus a shadow faster! But wait, where’s Jesus and all the angels...? There coming back in DEC 21st 2012 when their orbit of 3600 years comes back into range , first contact again! Wow.. there is so much hate just spewing out of people's... hands? Ironically, the one's bashing all the "religious nuts" are the one's spewing the hate. I'd hope you all aren't this hateful in real life. Actually, the bible is the GARBAGE'S GARBAGE'S GARBAGE ad infinitum. Because you believe that Mount Everest isn't there doesn't mean it isn't there. I've never physically seen it. Isn't it amazing that, in sport, faith (in your abilities) is more important than your abilities? Faith is huge in the human psychological makeup! You need to see things before you see hem to achieve them. Faith is build into us. Isn't it nice to just be at peace instead of desperately trying to disprove Faith! Strange that you think disagreeing or not believing in religion equals hate. Then again...religious people believe in witches, goblins, demons, devils, angels and god(s). Meanwhile, they call nonbelievers fools for trying to study things in front of their eyes instead of things in mythology. We must conduct research and then accept the results. If they don't stand up to experimentation, God's own words must be rejected. ok there is a god its an enlightened being that never dies and has nothing to do with any book. For example if there was an all knowing Deity then 1000 years before I'm born he knows if I go to haven or hell but he just wants to sit and watch that he already knows , please come up with something smarter! Doesn`t it bother you that you put more logical thought into choosing a car than you do in choosing a god? This is the current ad hominem fad – to call someone who points out your error a 'hater'. Too bad all the believers have to resort to name-calling instead of trying to engage their brains and think. My Bad for going In on the religious trolls on this site.But Thanx Science for revealing more secrets of Our world and Universe.Cause We all know if we prayed to God Fore More Insight that jerk would give us The Cold Shoulder As Always! I just asked my dog if he was Jesus and he barked. Do you think that means yes or no? If my dog is Jesus, is he going to get nailed to his dog house? No, because he is real and not a fairy tale. No, it's Jesus on the cross. Yes, definitely. Wait, now it looks like my dog's chew toy. Does this mean my dog is Jesus or is Jesus a dog? I see the face of Jesus in the picture above. This proves Jesus and God exists, don't you think. It's a miracle Wait, now it looks like my dog. I guess Jesus and God don't exist after all. IT LOOKS LIKE HOW THE REAR END OF JANET RENO WOULD APPEAR WHILE TRIPPING ON VISIONARY DRUGS. I think I saw Muhammad – did he have a beard? Unfortunately the image disolved and started to smell, so I had to flush. There are more posts on here from people complaining about religious nuts than there are posts from religious nuts. Did anybody read the article? On either side of this irrelevant debate? THE ARTICLE WAS VERY GOOD. IT IS MORE PROOF THAT RELIGION IS ALL WRONG. I don't know what propaganda you've been fed, but scientific progress does NOT disprove religion. Unless Scientists reaches the point where it has scanned the ENTIRE universe/multiverse, there is NO way to say religion is fake. SURE RELIGION IS FAKE. THE BIBLE SAYS THE UNIVERSE WAS BUILT BY SOME COSMIC DOLT IN 6000 YEARS BUT WE KNOWS IT'S BILLIONS OF YEARS OLDER THAN THAT. Religion is man-made. God and the Bible are not. The Bible doesn't limit the age of the cosmos to 6000 years. Religion does. Religion is often hogwash. The Bible contains words of life. THE BIBLE CONTAINS WORDS THAT SAY A DAY TO GOD IS A THOUSAND YEARS TO A HUMAN. SO WHEN GOD BUILT THE UNIVERSE OUT OF MAGICAL DIRT HE DID IT IN 6 GOD DAYS OR 6000 HUMAN YEARS. THAT'S WHAT THE BIBLE SAYS. NOT EXACTLY THE WORDS OF LIFE. MORE LIKE WORDS OF SERIOUSLY FLAWED FAIRY TALE WRITING. PLUS THE BIBLE TELLS LIES AND CONTRADICTS ITSELF. YOU SHOULD READ IT. IT'S FUNNY. Actually, religions are as false as any other ridiculous idea you would dismiss because it has no way to prove it. And, humans have been dreaming up these sorts of fantasies for a very long time, possibly as a way to delude themselves for a variety of reasons. So, if we take a fantasy dreamed up by some unwashed, uneducated and largely illiterate (by today's standards) people a couple thousand years ago, that has been massaged by countless other people since then to 'clarify' it, 'improve' it, and add defensive twists to the whole story, and feed it to lots of young minds, it's no surprise we find a lot of adults who think it's in some way true. It's still fake, though. Religion will never leave man , man will never know all there is. Science has existed for a few hundred years and continually being upgraded to replace previous flawed theory. Whose to say everything we think we know now will be totally bogus in 500 years. With each new discovery it becomes quite humorous to watch religionists squirm and stretch the boundaries of absurdity. Ah, yes, the "soul". Ever seen one? Weighed one? Seen any evidence of one in any reproducible way? And yet, many think they have such a thing as a "soul" because it's supposed to be a durable representation of a person's consciousness. Of course, this is just a play on one of our basic fears, that we are, in fact, temporary and purely a product of our physical existence. There's nothing to show us that there is a "soul" except some stuff written in fantasy books. I BET GOD IS SCRATCHING HIS HEAD AT THIS ONE WONDERING HOW STARS WERE FORMING BILLIONS OF YEARS BEFORE HE CREATED EVERYTHING. Further proof that religion is profit funded population control. Everytime there is a science article..... Jesus freaks and religious nuts show up. How insecure they are. There is a wide spectrum of permitted opinion within the Church on the issues surrounding evolution, from six-day, young-earth creationism to theistic evolution. There are very few absolute boundaries given by the Church on the matter. Two notable boundaries are that God created everything ex nihilo (Latin, "from nothing") and that each human soul is the special and immediate creation of God, given at the moment of conception. Within those boundaries, theologians are free to speculate on how to resolve scientific discoveries on man's origins with dogmas such as original sin. Is it not better to place a question mark upon a problem while seeking an answer than to put the label `God` there and consider the matter closed? everytime there is an article about science, atheist trolls start blabbing false propaganda about how bla, bla, bla proves that religion is a hoax. Give it a rest, science CAN'T prove if God exists or not. The only way to know is if either you look ALL over the uni/multiverse (which, humanity is FAR from that goal) or you ask a person who is dead already what happens to your soul/spirit/or whatever after you die (which is ALSO impossible). WHICH OF THE HUNDREDS OF MAN-MADE GODS DO YOU BELIEVE IN? ZEUS, JESUS, ALLAH.... WHICH ONE? Science cannot prove god (SIC) does not exist as it cannot prove a negative. But if something exist it must exist in such a way it can be measured so science could prove gods existence. haha just proof that there is no god... big bang theory. How so? Genesis is flawed. It's obvious God didn't create the world in 7 days. You won't find many Christians who believe in 7 day creation. Peter tells us "A day is like a thousand years in the Lord". Meaning Genesis can't quantify how God truly created the Universe. Is it really hard to believe through a big bang and divine evolution we came to be what we are guided by his hand? Most modern Christians accept Science for what it is. Science can never disprove God because what science unveils is how He designed it to be. And THIS is the insanity of christianity. Either it's ALL the word of god or none of it is. You cannot cherry pick which parts of the bible are true to hide the fact science has proven it to be the primitive creationist myth that it is. The more we study, the more we discover. Unless of course we turn to religion and invent happy fantasies to groom everyone's children to learn nothing and be totally controlled. Not in the Catholic Church. Catholic doctrine allows us to seek the truth. All we are bound to believe is God gave us all a unique soul. We are not bound to believe in a 7 day creation. What Science proves to be truth is truth. Science is not and never will be a threat to the existence of God. It's his tool, his design, what our feeble minds discover one spec at a time is nothing more then pieces of the puzzle. YOU PRAY TO MARY AND THE SAINTS. THAT ISN'T BIBLICAL. The Fact is the Bible Torah and Quran are all filled with made up nonsense and mythical stories .If the books are just ancient crapolla Then So is God! THE BIBLE IS FULL OF LIES AND CONTRADICTIONS. JUST READ IT FOR CHRIST'S SAKE. If one was to create a universe, one would start with the building block of life. To us people, we call this water. To God, the building block of life is matter. Just like water, matter is all around us, inside us, in the ground underneath our feet and in the air we breath. Just like water, matter exists in three states: the matter we know and can see all around us, antimatter, and dark matter. And although dark matter has yet to be effectively proven, antimatter was captured for the first time in November of 2010 by CERN, a particle physics laboratory in Geneva. For all their brilliance, however, the scientists conducting these and similar studies around the world are too focused on protons and electrons to realize that with alternate forms of matter comes alternate realms of existence complete with alternate forms of life. Imagine, if you will, heaven, an existence which is all around us, an existence in which God and the souls of our lost loves ones live in peace and harmony. Imagine a world full of wonder, a world where water can become wine, where any metal can be turned into silver or gold, a world which is fair and just, just as we were told in biblical times. The world you see in your mind is made up of dark matter, named as such, perhaps, so as to conceal the truth of the light from which it comes. 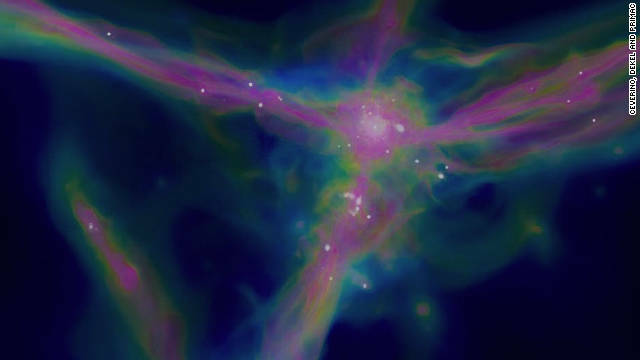 Although scientists have not yet captured dark matter as they have antimatter, astronomers are sure of it's existence because they can measure and calculate dark matter's gravitational effect, it's influence so-to-speak, on the cosmos. Antimatter, on the other hand, is very much like matter as we know it, but with the exact opposite physical properties – similar to the Taoist symbol, the Yin-Yang. Scientists generally agree that common matter and antimatter are equal in the amount of mass they make up within our universe. The remainder of the universe's mass is made up of dark matter and although calculations vary from one study to the next, scientists agree that dark matter makes up the vast majority of matter which can be measured in the universe; some studies showing as much as 80% or more. So if matter were poker chips, for instance, God's stack would be about eight times the size of our own. It's no wonder heaven is so much nicer than Earth – God breaks the bank at the casino – every time! Seriously though, astronomers are right. The Big Bang was the beginning of the universe. What astronomers don't know is that the Big Bang wasn't simply the division of matter into stars and planets. The Big Bang was very literally God's creation of the universe by taking the dark matter that is heaven and dividing a small piece of it evenly between the ice and steam that are common matter and antimatter. In this world God created our bodies, complete with brain functions we can now detect and map with MRI and CT-Scan machines. In antimatter, God created the opposite of our solid body mass, the steam-like spirit known as our sub-conscience or our guardian angel. Meanwhile, the rest of our soul remains in heaven as dark matter, plugged in – sort of. When God created us and placed us in this world, He essentially made the connection from our antimatter minds to our physical bodies on Earth a one-way road. Hinduism and various other Eastern religions and philosophical Dharma refer to this as the “consciousness”. Basically, we can each hear our angel, or our sub-conscience, within our thoughts and inner monologue, speaking to us, trying to convince us to do what is right and pouring on the shame and guilt when we've done wrong. Some of us would even argue that like a breath, like a gust of wind, our angels can make their presence felt in our world. And if we listen hard enough; if we learn to look for and to read the signs they show us, we can hear our angels communicating with us, helping us to find our way to God and that place we call heaven. Particle physicists might tell you that none of this can be true because when common matter and antimatter come into contact with each other, they “annihilate” each other in a spectacle of light, this being the reason they could originally only hold antimatter for a mere fraction of a second. Like steam and ice slowly reverting back to water, however, antimatter and common matter do not annihilate each other. Rather, they very quickly revert back to dark matter, back to heaven and the home of our Creator. The light created by this process is the very same which creates the tunnel of light described by people who have experienced death, only to return to life – and is the last dying function of the occipital lobe, or the vision processing portion of the brain. This is also the same light emitted by what we would call ghosts – or souls which are trapped between the two worlds of heaven and Earth. Because matter, you see, is the water of life preached to us in many of our ancient scriptures. This is the reason we find ourselves here yet again, at the crossroads of humanity's technological advancement and our inability to exist without annihilating each other and everything else we come into contact with. cute, very cute...I can make you feel nice warm fuzzies too, watch! Kittens in diapers, purring while being pet by a baby giggling in space suits on the moon, while their parents hover in space ships sipping tea. Did you feel that warmth? That means this statement was absolute in truth. Run with that, boooooooi!!! Where is your evidence for such a claim and, what are your credentials? There is really no such thing as matter. All matter is simply vibrations. The reason you can't put your hand through a metal object is because the vibrations are too fast, making it seem solid. Everything you see is literally an illusion, the brain producing chemicals from messages sent from the eyes that only see anything because of the sun. Time and distance are human inventions and do not actually exist. There are no events in reality, events are human inventions so that we can differentiate between happenings. In reality all things are one. Everything that exists is one process. We exist because the universe exists, we are not just a product of the universe but we allow the universe to exist as well. Our senses can only detect a very small amount of what is really going on. Um wrong Joe... The atoms in a solid are tightly bound to each other, either in a regular geometric lattice (crystalline solids, which include metals and ordinary water ice) or irregularly (an amorphous solid such as common window glass). Lol thats why you can not put your hand through a solid. For this being the informations age their sure are alot of clueless people out there that come with these crazy halfbaked idea on how they think the universe works with absolutely no preofessional or academic credentials. Sorry No BS but you are missing the point. The atoms in a solid are tightly bound but they are vibrations on a very fundamental level. Other than that the things you said are factually...on a human level. In reality there are no atoms. As is evidenced by the comments on this board, we are 29th in Science. And this is WITH GOOGLE available so you can just look up the correct answers. "...the vibrations are too fast...."
actually electromagnetic repulsion will keep our atoms from ever touching anything....check it out, http://www.worsleyschool.net/science/files/touch/touch.html ....does it look legit? We are behind in science. Many of the countries that are far ahead of us already understand vibrations, energy and non-existence. Only in the West where our science, politics and education not to mention ENTIRE culture is based upon an ancient book called the Bible do we lack true understanding of reality and thus physics. Google that. And now that we have that out of the way. How do ou explain that one can pt their hand through a liquid, where Kinetic energy or vibrations are moving the atoms faster? "Today young men on acid realize that matter is merely energy condensed, that we are one conciosuness of ourselves and that live is simply a dream. Here is Tom with the weather. Joe is quite literally correct in saying that all mass is energy vibrating at particular frequencies that give each substance its unique material properties. Quantum mechanics is still in a massive state of flux but String Theory quite literally states what Joe is saying: that the most elemental subatomic particles are actually vibrating bits of energy that interact in a particular way to form larger subatomic particles, so on and so forth, until you work your way up to a macro scale molecule with chemical properties. E= mc^2 after all. NO_BS; I say the natural state is cold, the absense of cold is hot. It take enerfgy to make hot, if you allow any hot objectg to lay on the table, it will cool down. In the vaccum of space, it is colder than a well digger's shovel in the Yokon! The rest of thels arguments belong in a college philosophy class. And out of it all, there are certain realities we must assume and live with. 'I know I am here because I because it hurts when my girlfriend goes out with one of my friends... What was it we were dicussing? Your head is filled with anti-brain. Were you born with this condition or did you get it in your church? "If one was to create a universe..." – Right. So when you start your thesis off with incorrect usage of the English language that set the tone for the utter nonsense that followed. That would be about 1/2 hours of your life wasted that you could have used to actually learning something. Absolutely zero evidence since big bang of anything other than cause and effect as the only forces acting on this universe or any of its creatures. Religious fantasies are no substitute for spectroscopic analysis..
...or a proper understanding of astronomy and cosmology. Your utter lack of understanding basic physics and chemistry is astounding. Another stupid living in a fantasy. You have suspend logical reasoning. For all those who claim to be "logical", I suggest you read "Summa Theologica", by Saint Thomas Aquinas. But it must be read through - not an easy task for those of you who can't even construct a sentence logically and grammatically correct. It won't be an easy task, but I assure you, that your life will never be the same after reading it. You will never be able to see the Universe in quite the same way again, no matter how educated you might be. I stopped reading because you said matter comes in three forms. Anti-matter, dark matter, and the matter we see and feel. Anti-matter and matter are two different things. The three (four, actually) forms of matter are solid (ice) liquid, gas, and plasma. Obviously we don't know about dark matter. Also, scientists don't generally accept the universe is half anti-matter half matter, it's one of the great mysteries of our time. Why didn't the big bang make equal parts? If it did, it all would've annihilated before spreading out ending the universe. And I'm not a physicist but I believe your comments about everything being mere vibrations is a part of string theory? Or even the concept of duality between waves and particles. It's weird but you can actually see atoms in electron microscopes...Aside from that, explain mass (haha, I know...I know). Regardless, if matter isn't really there, how do we make anything? How can we manipulate something that isn't there? Finally, anti-matter was collected LONG before CERN. It just takes a ton of energy to make just a few particles of it and very hard to contain. Anti-protons were made in 1955. Aside from artificial production, positrons are made during radioactive decay of certain radiological elements. I'm pretty sure it's positrons that're made. Have a good night and learn for yourself! You don't have to be a student to look things up on line or in libraries! My Bad for going In on the religious trolls on this site.But Thanx Science for reveling more secrets of Our world and Universe.Cause We all know if we prayed to God Fore More Insight that jerk would give us The Cold Shoulder As Always! They got all dis on dere compooter I guess in one dem data base holders. If everyone kepun uon shring data then how d he get in the base? So the big bang was actually just a God fart?! Oh no.. it is god who is working there.. creating the new stars.. you should not train your telescopes on it and study gods work.. we are not worthy.. go to the nearest church and donate all your research funds..
You don’t really appreciate science; you just decry religion, don’t you? Soooooo fashionable is being an atheist! Soooooo intelligent is being an atheist! Yep – we can't stop scientific advancements – and we should not. If religion is threatened by science, then it should be reformed.